Another good friend of mine has invited me for his wedding dinner. This is like the third or forth wedding dinner of the year? That being said, it was rather awkward for me to be there, only because my ex-girlfriend was there too. However, we sat at different tables so it was a little better. Still awkward, but it was OK. I don't know what it states there, but it seems like a welcome message. I like the drawing of the bride & groom though. Saw a girl with wicked green hair! The highlight of the evening, wasn't the bride & groom. Unfortunately, this male dai-kam-jie (Cantonese for Bride's Chaperone; usually a female) is so distracting with his ah-gua (Cantonese for Gigolo) fashion, going table to table. It was a scary experience for me to witness such an event; but the folks there seemed to like it. Can you differentiate the drinks: which is whiskey and which is Chinese tea? 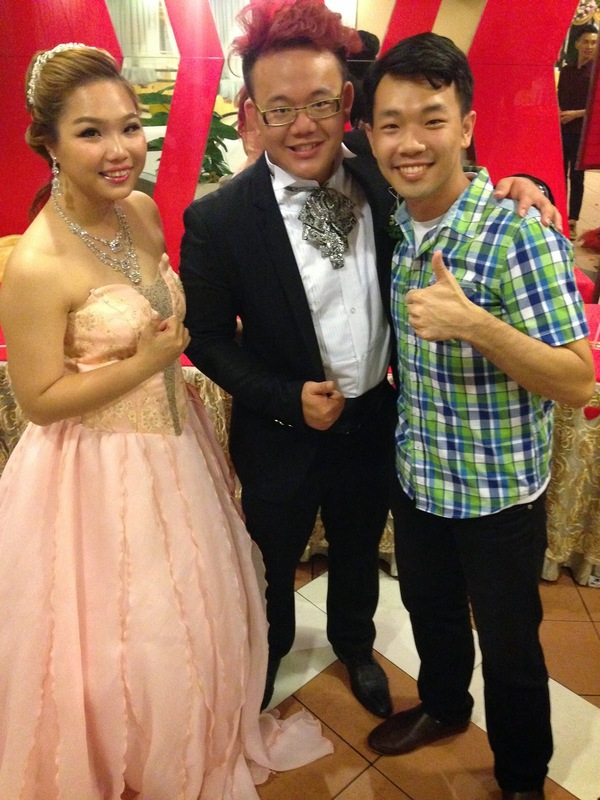 Congratulations to the newly wedded, May & Kim Seng! They're a match-made in heaven! Both are funny, practical and very loving. It was truly a legendary night!